I’ve seen Shakespeare’s ‘The Tempest’ on at least six occasions (including Ian McKellen at Leeds, Derek Jacobi at Sheffield, and London appearances from Patrick Stewart, Antony Sher and Roger Allam at The Globe). It’s a magical romance which concerns the deposed Duke of Milan (here played by the reliable Simon Russell Beale, himself a former stage Ariel), who is shipwrecked on an island ‘full of noises’ with his daughter Miranda; here they live with his library of books, a monstrous creature named Caliban who they keep as servant, and an airy sprite called Ariel who gives service to his master in anticipation of gaining his freedom. Gregory Doran’s production is one of flashy technical and digital effects, in collaboration with Intel and The Imaginarium Studios, including a 3D representation of Ariel – although I found this more distracting than anything else, as the actor playing the part (and causing the body movements of the character) was on stage in all his scenes. 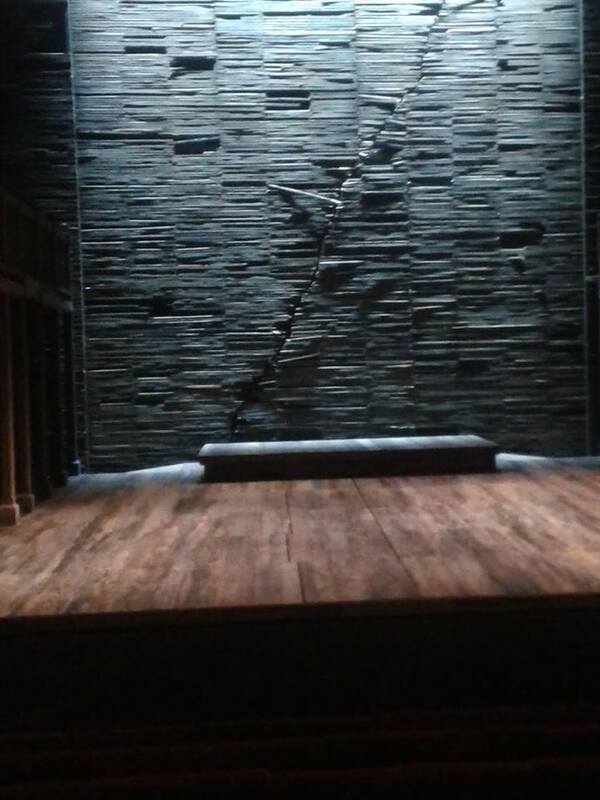 However, the technical effects ranging from the light and sound giving the impression of a moving ship at the beginning of act one, a huge depiction of slavering dogs, and the memory of Ariel’s imprisonment in the cloven pine, were impressive. Joe Dixon’s Caliban and Mark Quartley’s Ariel were very memorable and touching, balanced out well by the comedy of Simon Trinder’s sinister Trinculo and James Hayes’ Stephano (although the ‘two-legged monster’ routine could have been funnier than it was). For me, Jenny Rainsford took a while to come into her own as Miranda, and I didn’t feel connected to her until the ‘brave new world’ speech near the end, and Daniel Easton’s Ferdinand was bland and uninteresting. Simon Russell Beale’s Prospero is the highlight of this production, his small, stocky statute mirrored by that of Jonathan Broadbent’s little ball of hatred as his brother Antonio. What this Prospero brings to the text is sometimes missed by his colleagues, and the final speech is truly touching as the audience is released (‘let your indulgence set me free’) – if this was Shakespeare’s way of saying goodbye to his beloved theatre, it is an effective one. My second Lear of this month is rather more traditional and definitely much safer than the one over at the Old Vic. 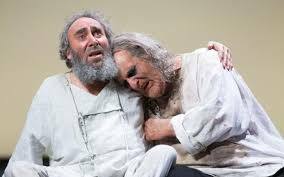 Another collaboration from RSC power couple Antony Sher and Gregory Doran, this Lear is opulent, regal, but, except for David Troughton’s magnificent Gloucester and Natalie Simpson’s sweet Cordelia, the play is strangely unmoving. A very lengthy opening scene has the displaced and homeless sitting on the stage until they are rudely scattered ready for the entrance of the king, a Sher hunched up and swathed in furs, with a rasping voice. He appears behind glass which is slowly lowered to reveal the full majesty. He gives away his kingdom to the empty flattery of his daughters, who clearly loathe him (later, each will recoil from his offered embrace), and in a first display of a mind in disorder, disowns his ‘joy’, Cordelia, cast adrift in her bridal gown to be taken up by a sympathetic King of France. Antony Byrne portrays Kent and in disguise, particularly, as a tattooed skinhead, he excels, and his final scene is well played. Graham Turner plays a Fool first confident, funny and chatty, but eventually bewildered in the eye of the storm. We do not see him in the second half, as is usual, but we are concerned for his survival. As the brothers who war due to the one’s legitimacy and the other’s bastardy, Paapa Essiedu was not convincing for me due to his total sarcasm for all around him and his throwaway asides; better was Oliver Johnstone’s Edgar who went from a bookish fop through impersonation as Poor Tom to sword-wielding champion with ease. The relationship between Regan (Kelly Williams) and Cornwall (James Clyde) is presented very much as one orchestrated by her (when he is mortally wounded and asks for her hand, she coldly walks away without a glance). I much preferred Nia Gwynne’s Goneril, a lady with pure ice in her veins. The eye-gouging scene may be misjudged – I had trouble hearing lines spoken within the perspex box from the stalls, so I feel for the gallery – but the effect is probably on a par with the thrown eyeball over at the Old Vic. Where this production misses for me is the final mental disintegration of Lear. I was not moved either by his recognition of Cordelia or his ‘howl, howl’ at her death. And I know Sher has the emotional pull in other roles (his superb Willy Loman, for example, so this was a surprise). I am glad to have had the opportunity to see both London Lears at such close proximity, and both have much to recommend them. So see both if you can, but you have to move quick to see Glenda Jackson in the role (to December 3rd). 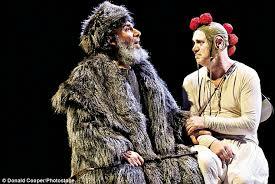 The RSC King Lear continues at the Barbican until December 23rd. The final play in the Shakespeare Tetralogy which has now evolved into ‘King and Country’, so from next month, if you missed the first three plays, ‘Richard II’ and ‘Henry IV parts 1 and 2’, go forth to the Barbican and make good that omission. This is, surprisingly, the very first ‘Henry V’ I have seen on stage. Of course I have seen the Olivier and Branagh films, with their rousing St Crispin’s Day speeches, and the BBC Shakespeare and Hollow Crown versions, but have missed out on real life versions. So even if I hadn’t seen the preceding plays, I would have hot-footed it to this one. Alex Hassell returns as the king he became at the end of ‘Henry IV part 2’, and he is still not quite the regal or commanding monarch: he had doubts, he shows some emotion at the losses of battle and the tough decisions he has to make to maintain army discipline. It is an excellent performance, and I believed in him completely. Also good in this cast are Oliver Ford Davies as a beautifully enunciated Chorus in a cardigan, the ever-reliable Jim Hooper in two roles and two beards (an early scene as the Polonius-like Archbishop of Canterbury pulls the humour out of an Act One scene), a delicate Jane Lapotaire as the Queen of France, and Joshua Richards in a brace of roles as boozy Bardolph and fiery Welshman Fluellen. The set is rather good, too, with golden beads hanging in chains at each side of the stage, clouds, rain, and, as the Chorus asks us, a set of imaginary horses. Gregory Doran’s productions often put humour ahead of the more serious aspects of the play, and here there was a bit of what can only be called ‘audience participation’ in Henry’s wooing scene with Katherine (Jennifer Kirby, who runs with both her scenes, playing broken English for fun) which didn’t quite work. However, post-battle, there was a moment when the balconies and stage filled with mournful singing for the dead which was very moving. I should also mention Sarah Parks’ Mistress Quickly, and her account of the last moments of the life of the (unseen) Sir John Falstaff, who died ‘babbling o’ green fields’, and Simon Yadoo’s impenetrable Scottish soldier, who offered comic relief in the calm before the storm of Agincourt. The International Beckett Season at the Barbican showcases a range of productions of the plays of Samuel Beckett, the centrepiece being this revival of the 2013 version by the Sydney Theatre Company. In the roles of Vladimir (Didi) and Estragon (Gogo) are a pair of actors best known on these shores for their screen credits: Hugo Weaving, who was Elrond in the ‘Lord of the Rings Trilogy’ and Mitzi in ‘The Adventures of Priscilla, Queen of the Desert’; and Richard Roxburgh, who was The Duke in ‘Moulin Rouge’ and Sherlock Holmes in ‘The Hound of the Baskervilles’. Not looking remotely film-starish here, both men effortlessly inhabit their roles and are clearly at ease with working together. Playing broadly in the vaudevillian style, Weaving is clearly the posher of the two, with decayed dignity (note the way he puts on his new hat and tosses his greasy hair), while Roxburgh is lower class, with comic expressions, sleepy resignation, and more accepting of the plodding boredom of their daily lives as tramps, eating carrots and radishes, suffering from tight boots and urinary problems, and waiting for the ever-elusive Godot. Each day in this bleak landscape with one stick-like tree and a derelict black building facing back-on to nothingness is clearly much the same, where the two friends pass the time in idle chit-chat, attempts to entertain each other, and thoughts of suicide which they can never follow through. Into this limited world wander two men who impact on the story in different ways in each of the two halves – the blustering, charming and faintly ridiculous Pozzo, who is all bombast in his first appearance and vaguely pathetic in his second one; and witch-like Lucky, panting and slavering with the bags he can only briefly put down. As Pozzo, Philip Quast impacts both as the cruel slavemaster and the blackly humorous bon viveur who clearly loves the fine things in life with his wine, pipe and fur-trimmed coat. Starkly bullet-headed and neatly-bearded, he resembles a carnival barker who is slightly corrupt – and in the second half there is a fair amount of physical comedy which is well performed with Weaving in particular. Lucky has wild white hair and a ghostly, sickly pallor, as if a gust of wind would finish him off – Luke Mullins catches the sense of the absurd in his demeanor and monologue, but he didn’t quite pack the emotional punch or the virtuosity of delivery I saw in a previous Lucky (Richard Dormer in 2006). For the first UK production in the 1950s, director Peter Hall stated he did not understand the play and did not need to to make it a success: for the Sydney production, Andrew Upton explains in the programme that this version is a group collaboration using Beckett’s detailed stage directions as a starting point. Certainly the cast work well together in a play which must be physically and mentally draining to perform, and there are several lovely moments between Weaving, Roxburgh and Quast in particular, causing some genuine audience laughter as well as a reflection of the emotional starkness of this prime example of Theatre of the Absurd. Making its home for Christmas at the Barbican Centre (one-time London home of the Royal Shakespeare Company), these productions of the two Henry IV plays have been heavily trailed with Sir Antony Sher’s return to the Company in the role of Falstaff, collaborating professionally once more with his off-stage partner of twenty-seven years, the RSC’s Artistic Director Gregory Doran. The two plays are very different in tone – Part 1 is a mix of battles and comedy, while Part 2 is more reflective on the passing of time and the onset of maturity on the part of Prince Hal (Alex Hassell, who is very good indeed and a potential rising star for the RSC). 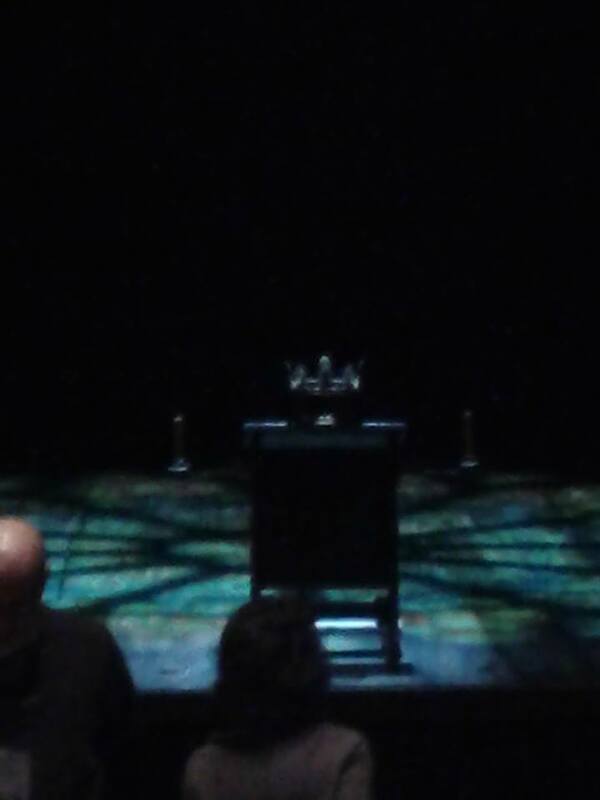 The scene which opens Part 1 may be a trifle bewildering for those who were not present at Doran’s earlier production of Richard II, as the ghost of that deposed and murdered king appears to watch over the scene where Henry IV (Jasper Britton) puts on the crown you see center stage. Britton portrays the anger and doubt of the King, but misses the depth of feeling required to portray such scenes as the character’s exchanges with his dissolute son in both parts, especially those which should be moving to watch in Part 2. The son of veteran actor Tony Britton, he also resembles his father at times but does not achieve the majesty or power of an anointed monarch. I found myself thinking back to David Troughton’s portrayal of Henry IV (also for the RSC) back in 2000, in which he was convincing as both dangerous warrior and sick man losing his grasp on power and life. The scene which introduces both Hassell’s Hal and Sher’s Falstaff here involves a couple of good-time ladies frolicking with the Prince, and a comic reveal to find a Falstaff shaking with DT’s and asking ‘the time of day’ under the sheets at the bottom of the same bed in which the Prince and his ladies had just enjoyed themselves. It makes clear at once the unhealthy closeness and influence the fat dissolute man has over the heir to the throne. I felt the scenes in the Tavern were a little muted, perhaps because of the staging, which kept events confined in the middle of the stage. The battle scenes, though, were excellent, with a backdrop of scenery torn asunder and illuminated in orange light. But casting went awry with Trevor White’s Hotspur, who came across as part ranting child with ADHD and part tiresome nitwit, and it was a relief to see his demise at the close of part 1. Strong scenes in part 1 included the memorable segment where Falstaff plays the king interrogating his son about his followers, and Hal then taking on the persona of his father to say he can, and will, ‘banish plump Jack, and banish all the world’. There is also the amusing scene with Francis the waiter ‘anon, anon, sir’, and the majesty of Owen Glendower (played by Joshua Richards, who is also a rouge-faced Bardolph, and who played Richard Burton in a solo show not so long ago for stage and screen). On to the reflectiveness of part 2, in which Oliver Ford Davies and Jim Hooper (trivia fans may note that he was the former long-term partner of Antony Sher, pre-Doran) are a joy to watch as Justices Shallow and Silence, the perfect essayists of vacant ageing and lost opportunity. Their early scene together, lamenting their friends who are now dead and old, moves into an amusing scene where Falstaff searches for men to join him in battle, and finds a rag-bag of unsuitables similar to the ‘rude mechanicals’ of A Midsummer Night’s Dream. The man called ‘Wart’ in particular causes amusement when he cannot even lift a rifle. Meanwhile, Henry IV is ailing, and sad, and beginning to realise he will never make that promised pilgrimage to the Holy Land. Hal continues to frequent Eastcheap with Poins and to neglect his destiny as leader, until the turning point when he finds his father sleeping and thinks him dead, taking the Crown and reflecting on the grave responsibility which comes with becoming King. Although this scene is not as powerful as it should be, the ending scene where Hal rejects his former life, and his former friend, with ‘I know thee not, old man’ does pack a punch (especially coming so soon after the amusing drinking scene with Falstaff and the Justices, in which even the reticent Silence finds liquor makes him sing). This pair of plays is skewed towards Sher’s Falstaff, and he does show a gift for comedy we haven’t often seen before (although in Cyrano de Bergerac in the 1990s he did show signs of a range which included playing for laughs), as well as portraying the increased infirmity which comes of drinking too much sack and being too dissolute – whether wriggling on the ground like a beetle trying to get up at the end of the Shrewsbury battle in which he plays dead, exolting the virtues of drinking sack, or exchanging a rather tender moment with his whore Doll Tearsheet when he is about to leave for the wars. Elsewhere in the cast memorable turns come from Robert Gilbert as Mortimer in part 1, Jennifer Kirby as Lady Percy, Nia Gwynne as the Welsh singing Lady Mortimer in part 1 and Doll Tearsheet in part 2, Antony Byrne as a wild-haired Pistol, Sam Marks as an excellent Poins, and Paola Dionisotti as a memorable Mistress Quickly. Michael Clark remains an associate artist at the Barbican Centre and as part of that association, has created a new double bill of work, entitled ‘New Work’, with music in the first half by Scritti Politti, and in the second by Pulp/Relaxed Muscle (who appeared live at the London dates). Clark’s choreography has matured over the years from his initial shock tactics and freak performers (like Leigh Bowery) to fluid movements, emotionless trust between his performers (including Kate Coyne and Jonathan Olliver, formerly of the Northern Ballet Theatre), and a slightly naughty vibe, underpinned by his own bemusing cameos. I remember his leading roles and can see his influence directly in a couple of his younger male dancers – however, in this show there may be a little too much going on at times, notably a scrolling set of texts which eventually spell the sentence ‘I’m thinking of opening a zoo’, and the aforementioned live band performance which is rather intrusive when singer Jarvis Cocker blocks the audience view of the dancers. Costumes have always played a big part in this group’s performances, often being a draw in their own right. Here the focus moves from men in short dresses through to two tone skin tight bodysuits. The opening of the show, too, is novel – a dancer slowly descends to the stage, suspended by a very flimsy looking wire. ‘New Work’ showcases mesmerising movement with pulsating music beats in the second half, and sweet mellow vibes in the first. This group does not disappoint, and long may Clark continue to make his brief showcase appearances alongside his talented performers. Originally published on my LiveJournal blog on 20 August 2011. The production from the Lincoln Center Theater of ‘South Pacific’ which received such rave reviews in New York has landed in the UK to run for seven weeks at the Barbican Centre before it tours the country. The last full production of this Rodgers and Hammerstein show was in 2001 at the National Theatre, starring Lauren Kennedy as Nellie and Philip Quast as Emile – enjoyable though that show was, for me there was little visible chemistry between the leads in the central love story. Samantha Womack “washing that man out of her hair”. Fast forward to now. In the transfer from US to UK some key roles have been recast, notably Samantha Womack as Nellie and Daniel Koek as Joe Cable, as well as Alex Ferns as Luther Billis. Coming over from the US are Paulo Szot as Emile (but note he is not in the whole run at the Barbican – Jason Howard plays the role from 29th August to 21st September), and Loretta Ables Sayre as Bloody Mary. Szot is a superb Emile, with a wonderfully rangy bass voice – he makes the most of his two showpieces, rightfully receiving prolonged applause for ‘This Nearly Was Mine’. He is a very good actor, too, and gives what could be quite a dry role some humanity. Womack is far better than I expected – she has played Miss Adelaide in ‘Guys and Dolls’ but doesn’t really have a musicals pedigree. On this evidence she should/will have. Her joy in her ‘Wonderful Guy’ is infectious to watch and her struggle with prejudice and love is touching. I really like this production, which has feet tapping, and brings both smiles and a lump in the throat. In actual fact, it is superb, giving full throttle to those marvellous songs while still making matters of prejudice relevant today. 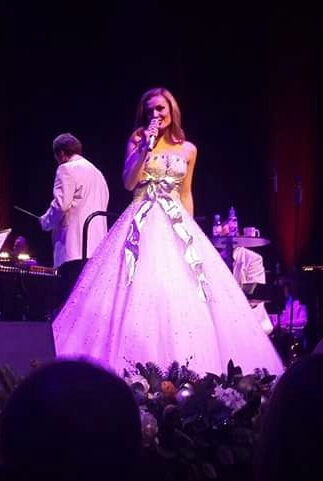 However a note to the Barbican – your air conditioning is too cold 🙂 That aside, a wonderful, no, an ‘enchanted’ evening.